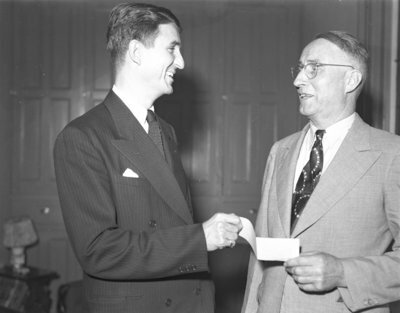 Black and white negative of a cheque presentation at the Chamber of Commerce Industrial Banquet held at the Masonic Lodge. Richard C. Adams (President of S.K. Wellman Co. of Canada; left) presents a $500 cheque to Chamber of Commerce President, William Davidson. The cheque was for the promotion of industrial development in Whitby. The Whitby Chamber of Commerce held an Industrial Banquet on Thursday, September 5, 1946 at the Masonic Banquet Hall at 6:30pm. The speaker at the event was Mr. F.W. Collins, Industrial Manager, C.P.R. Montreal, Quebec. According to the program, the menu was tomato juice, chicken, peas and carrots, celery hearts, old cheese, pie and ice cream, coca cola, tea or coffee, peanuts and candy. The order of the program is as follows: (1) Sing Grace; (2) Dinner; (3) The King; (4) Entertainment: Solo-Ivor Davies, Robert Wagstaff; (5) Introduction of Guests and Address of Welcome: The President, Wm. Davidson; (6) Community Singing; (7) Secretary (Review): Gordon Osborne; (8) Solo: Ivor Davies; (9) Introduction of Speaker-Mr. F.W. Collins: J.A. Dunlop; (10) Vote of Thanks: Stewart Alger (11) Toast to our Guests: Jos. Bannigan; (12) Toast to Town of Whitby: C.A. Bryans; (13) Respond: Mayor Deverell; (14) Vote of Thanks: Sam Peake. Chamber of Commerce Industrial Banquet, 1946, Marjorie Ruddy, Whitby Archives, 18-001-015.